East Anglia’s Premier Complementary Health Care Clinic | Yoga benefits – plus try our new class for free! Yoga benefits – plus try our new class for free! Putting your body into these positions does a wealth of good for your muscles, organs, joints and mind. Each of the dozens of poses you might encounter in a Hatha practice offers innumerable benefits. Start your practice and start to experience some of the most notable ones. Read More:What is Hatha Yoga? 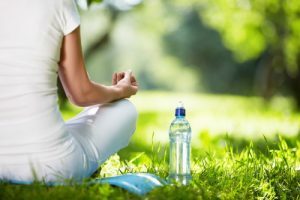 Regular yoga practice can help alleviate high blood pressure, as well as reduce the number of uncomfortable anginal episodes in people with cardiovascular disease, reported a research review published in the Indian Journal of Community Medicine in 2014. Further research reviewed in this paper showed that yoga also improves how blood flows to the heart and lesions on the heart indicative of the disease. Weight-bearing yoga poses, such as Tree, Side Angle, Triangle and Warrior I, II and III, help reverse bone loss in people with osteoporosis and osteopenia. A study published in Topics in Geriatric Rehabilitation in 2016 showed that just 12 minutes of practice daily can build density in the spine and femur. Many Hatha poses improve your core strength — that’s the center of your body, consisting of the spine, abs and hips. A strong core keeps you functional and wards off injury; it also improves your performance in sports and fitness. Poses such as Boat, Plank and Downward-Facing Dog strengthen your external obliques; Chair and Warrior I target your buttocks; and Chair and the Half-Lift improve the strength in your paraspinals, which are the muscles surrounding your spine and assist when you twist and bend. When you don’t work your joints to their full range of motion, they tend to stiffen up and limit your movement. Hatha yoga poses work your joints in multiple directions, thus improving your mobility and flexibility. A study in the Journal of Physical Therapy Sciences from 2015 found that just one 90-minute yoga session per week greatly improved mobility in the joints, especially the spine, of women aged 50 to 70 years. Modified Hatha yoga poses are an effective way to treat the symptoms of low back pain, and prevent disability associated with this condition. A review of the research in the Journal of Orthopaedic Rheumatology published in 2016 concluded that Hatha yoga can be as effective as other non-drug treatments in treating low-back pain and may actually be better than usual care methods. Hatha yoga poses can improve your ability to know where you are in space — that’s your balance and proprioception. Good balance keeps you from being klutzy and potentially falling and hurting yourself when you encounter an icy street or change in terrain. You also stand taller and look more confident as balance and proprioception impact your posture. When practiced regularly, Hatha yoga poses improve multiple aspects important to physical fitness. As revealed in a study published in a 2001 issue of Preventive Cardiology, a minimum of two yoga classes attended per week — these included 10 minutes of dynamic warm-up poses and 50 minutes of asana — for eight weeks improved oxygen uptake, muscular strength and endurance and joint mobility. We have an exclusive Hatha Yoga for beginners class starting Thursday 5th October at 6pm! The first class is COMPLETELY FREE – contact reception to reserve your place on 01603 665173 or simply email [email protected]. For further details click here.